I just love this simple card. Its photo does not do it justice. I just had to create with another piece of the Amberley Grace cardstock. This is the art of rubber stamping in its simplest form. And as the old saying goes, “KISS… Keep It Simple, Stamper!” I’m keeping this card for myself. At least until I can find a good home for it. It can sit on my stamping table and “inspire” me. I made this greeting card by layering a 4-1/4 x 5-1/2 piece of patterned cardstock from the Amberely Grace Collection (from The Angel Company) over a folded 5-1/2 x 8-1/2 cream card base. I used the 1-3/8 inch square punch near the bottom right hand corner to create the window. I made the green frame by punching the 1-3/8 square punch inside of the 1-7/8 scalloped square punch. I adhered it to the card front to frame the window. 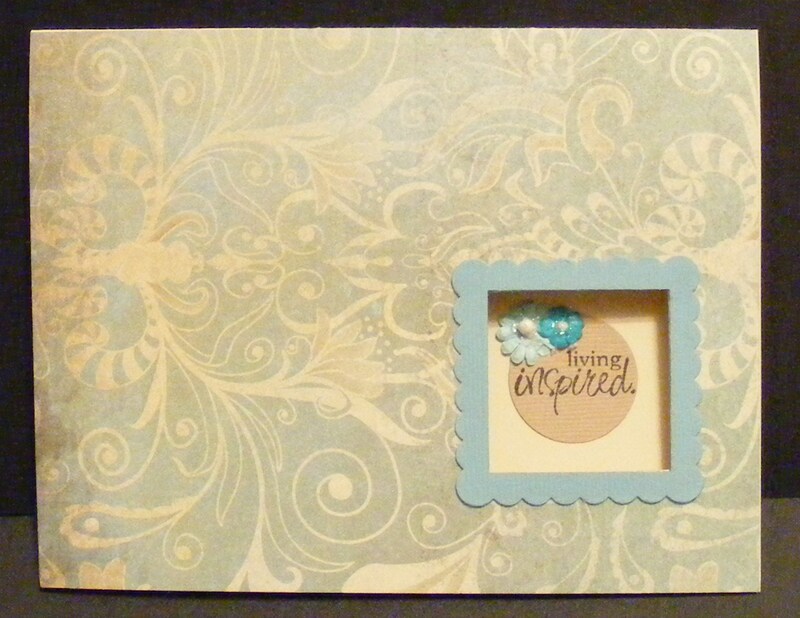 I stamped the sentiment “living inspired” on tan cardstock and used the 1 inch circle punch to create the circle. I adhered flowers to the circle and applied Stickles to the flowers. Then I adhered the cirlce to the inside of the card in the middle of the window. If you’d like to see it in person, you can purchase it through my Etsy store. All supplies used are from The Angel Company. This entry was posted in Cards and tagged art, greeting card, rubber stamping, The Angel Company. Bookmark the permalink.